Nat Robinson is the Head of Marketing at MileIQ, a mobile that functions as an automatic mileage tracker for driving deductions and expenses. It has revolutionized the workflows as well as saved time and money for a variety of users from self-employed professionals to large enterprise organizations. MileIQ’s parent company, Mobile Data Labs, was acquired by Microsoft in late 2015. 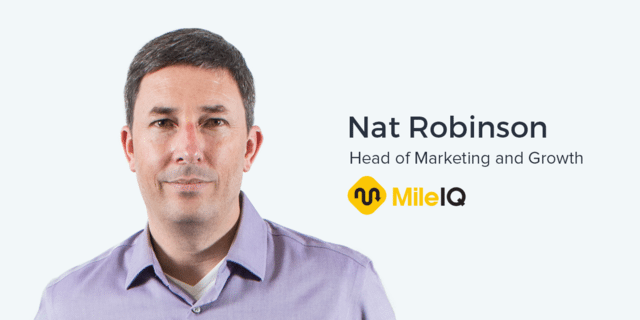 Prior to MileIQ, Nat was the VP of Marketing at VMWare and worked with SlideRocket, a PowerPoint competitor. He started his marketing career at Oracle, where he spent 13 years ultimately serving as a VP of Corporate Marketing. Here are some of the topics discussed in this episode. As essential and powerful modern inbound and outbound marketing is and despite the rate at which it’s growing, nothing compares to organic, honest enthusiasm and evangelism from your customers themselves. Your product is your best marketing – whether you’re a customer- or a product-led company. Whether that means you’re actually using the product to do marketing for you, maybe through a referral program, or that the product is so amazing that people are evangelizing it by themselves. If you can create that kind of reaction, not necessarily to your brand but to your product, then that is a solid underpinning for growth.. Referral programs and building in other incentives or forms of virality within the product can function as an excellent driver for growth. However, the story of a user’s “aha moment” has tremendous potential for generating loyalty and evangelism. Marketing is frequently more effectively targeted to the end user instead of the authority making the purchase decision. We’ve purposely taken a bottom-up approach so let’s go to consumers, or in this case, self-employed folks first or really end users first because we felt like that would bubble up into the enterprise and that’s kind of what’s happened. While there might be value propositions of your product for all business stakeholders, make sure you contextualize and personalize your marketing to cater to all of their different needs. It’s important to make it as easy as possible for your target users to understand the real unique value proposition of a product. When this is done correctly with the right audiences, both in the acquisition and onboarding stages of your funnel, it can create a powerful emotional response for products, no matter how bland their function might appear. It’s a very wide variety. It’s kind of been surprising that people, for a tax-related app and finance-related app, would have these kinds of emotional responses to solving this problem. When you read the reviews, it’s almost visceral. It seems so tangible that people are having this strong emotional response to it, whether it’s the finance component, the time component, or the relief of not having to think about it anymore. Instead of offering the surface value proposition of the money or time that you save when using a product, consider what that saved money or time literally translates into for your target users whether it’s an extra hour with their family, or more cash to invest in a business. Note: this transcript has been lightly edited for clarity. Ander: I am currently in the quite beautiful Microsoft offices here in San Francisco, probably one of the many Microsoft offices here in San Francisco. And I am here with the Head of Marketing and Growth at MileIQ, a Microsoft company, Nat Robinson. Nat, how are you doing? Nat: Hi Ander. I’m doing well, thanks. Ander: Thank you so much for taking the time to come on the show. You’ve got a really nice space here. It’s great being able to see all the other offices everyone has in San Francisco when conducting interviews for this podcast. Nat: Yeah, it’s a little nicer than our previous offices, our startup offices, so we’re pretty happy to be here. Ander: Yeah! And, MileIQ was somewhat recently acquired by Microsoft. Nat: Yeah, about eighteen months ago we joined the Microsoft family of companies. We’re still a subsidiary company of Microsoft, so we have some independence. But we’re very happy to be part of the larger ecosystem that is Microsoft. Before we dive into all of these great things that I talked about in the intro and that we’ve got on the agenda today, let’s hear about MileIQ. I told our audience a little bit about it before we actually sat down for this conversation, but what is this product that you’ve been working on for a little over three years now? Nat: Yeah. It’s had a few different iterations but at the core, it’s a mobile app and service that helps you log your miles, the miles that you drive for business whether you’re a realtor driving from gig to gig, or a side-hustle person maybe doing some gig economy driving, or you’re employed and you’re working as part of your business day. Really anyone who drives for work can use MileIQ and use it to automate a really time consuming and previously laborious task that, quite frankly, a lot of people just didn’t do before. Or maybe they did manually using a pen and paper logbook, you know? That’s the analog version of MileIQ. We’ve been around for about three years now leading the space in terms of an automated version of this service – something that you could call ‘touchless’ if you like. You install it on your phone. It runs very quietly in the background, doesn’t require a lot of interaction from you, and just goes about its business logging your business drives – actually logging all your drives – and then, y you can come in when it’s convenient to you and say, ‘Oh, these drives were business and these drives were personal,’ with a simple swipe and classify your drives that way. Right for business, left for personal. All the work has been done for you. You just come in and classify and then the benefit obviously is you either getting reimbursed or being able to deduct those business miles. Ander: If I were using it when I was a consultant, certain parts of my life would have been much simpler. Haha. Nat: Yeah, I mean, obviously we have great reviews in the app store and I think, for a variety of reasons that we will probably get into today, predominantly is people who weren’t doing this before now can have this task taken care of by MileIQ. They can go about their business day knowing that it’s running in the background on their phone and taking care of business in terms of their mileage log. Ander: Awesome. Well, you’re working for a really cool company and really cool product right now but you also have a really personal professional history. You spent a lot of time at Oracle and in other executive positions as a marketer in the past. Maybe you can tell us just briefly how you ended up here, what you did before, and what brought you to MileIQ. Nat: Sure. I started, kind of ironically now, working for the tax department in New Zealand where I’m from. The Inland Revenue Department in New Zealand. The equivalent of the IRS here. That was kind of a very traditional data-processing, large mainframe kind of environment. It was a good first job after getting my IT degree but I knew that I didn’t want to stay there that long and fortuNately the lady who sat next to me was the wife of the Chief Marketing Officer at Oracle in New Zealand which led to me becoming a sales consultant in New Zealand doing database and tools and kind of 4GL stuff at the time. One thing led to another and I found myself here in Redwood Shores at Headquarters for Oracle and had kind of a whole career there– about thirteen years climbing the ladder in a large corporate environment and having some success. After a while I realized, “Hey look, I’m here in Silicon Valley.” There is so much innovation and so many entrepreneurial things happening. I’d be crazy not to jump in and try something like that. So after that period at Oracle, I went to a very early startup called SlideRocket. I was the first hire after the founders and they were taking on PowerPoint, essentially with a Cloud-based version of a competitor to really change up what a presentation meant. And in many respects we were competing with Microsoft PowerPoint. Ander: A very tricky thing to compete against. Nat: Taking on a gorilla, yeah. And it was great from a PR point-of-view because, you know, we could say, ‘Are you bored with Power Point?’ and everyone would universally say yes and respond to that. Haha. Nat: S, I think we had a great run at SlideRocket. I think it’s another space where we asked ourselves… An online presentation, what does that mean? We helped define what that meant during the time. The company was acquired by VMware. I didn’t want to stay for another large enterprise company like VMware, so I quickly moved on to some other things. And really, SlideRocket was the beginning of my startup career, if you compare that to an enterprise software marketing career at Oracle. I’ve been doing startups ever since. I met Chuck Dietrich at SlideRocket and we hired him as the CEO during one of the rounds of funding there. Then I went off and did a few other things after SlideRocket but then reconnected with him and Dan Bomze as MileIQ was getting started. I think one of the biggest things that drew me to MileIQ was the utilitarian Nature of it. It was a very simple app in concept but it had a very broad appeal. And even then, at the very first version, users were responding so well to it. You can go back and look at the reviews back then. That was one of the things that drew me to the app and every day helps me come to work. The user reviews are phenomenal in terms of not just the utility that they get out of it but the benefit that they get, and quite a wide variety of benefits. Ander: Sure. So ,throughout this whole time from when you started at Oracle and when you got into marketing, how would you describe your marketing philosophy? What’s something that you think is important when you’re considering marketing as a whole? Nat: I think one tenant that I always stick to is that your product is your best marketing – whether you’re a customer- or a product-led company. Whether that means you’re actually using the product to do marketing for you, maybe through a referral program, or that the product is so amazing that people are evangelizing it by themselves. If you can create that kind of reaction, not necessarily to your brand but to your product, then that is a solid underpinning for growth. Ander: I would complete agree. One of the things that I think is interesting is when you have a product like MileIQ or something else that has these very real-world applications, it’s a very different quality than marketing SaaS or selling enterprise hardware or an analytics tool in that it is really affecting something that’s already happening in the day-to-day lives of so many businesses and so many consumers. Can you talk a little bit about what it’s like bringing this digital world into the analog world and solving that problem for that group of people? Nat: ‘Oh, wow, if I had to do that for every drive…’ And not just my business drives. I have to log all my drives and then say which ones were business. There’s very few people who can actually do that accurately. We’re human, we’re fallible, we get side-tracked, there’s a lot of demands on our time. We do hear from customers who are like, ‘I do this and I do it well and I don’t need an automated solution or a mobile solution.’ And that’s amazing. We salute those folks. Nat: But for most of us who can’t do that, then it’s nice to have a backup in the form of a service like MileIQ. But the other part of the problem is that even if you’re aware that there’s a mileage deduction (and some people just aren’t, so there’s an education component here) but even if you are aware, people tend just not to do it. It’s this huge, time-consuming task and they get to their accountant or they get to the end of the year to file their taxes and what happens is they end up guesstimating a number. That’s problematic from a couple of different points-of-view. One is they tend to underestimate because they didn’t realize how much they actually drove for work. This is actually one of the comments we see from people who use the app is, ‘Wow, I didn’t realize I actually drove so much for work now that I see every drive popping up.’ That’s between 20% and 40% of the drives that they were missing out on because they just underestimated. Nat: The other problem is that if you don’t have the log and you get audited, that creates some real-world problems for you with the IRS. Ander: Yes, a different category of problems! Nat: Multi-faceted. You could lose your entire deduction, you could have to pay a fine… it goes on and on. Another thing is that we have users who are kind of using MileIQ as an insurance policy. It’s $60 a year, or $59 a year. If I drive a lot, that’s not a lot to pay just to have a log of all my drives. Even if I didn’t classify any of the drives, that’s just a back-up. I know that I have it logged so that if I ever get in that situation of being audited that I have it. I’m good. Those are some of the problems or the different kind of ways that people are using MileIQ. Not the normal way, necessarily, but maybe more just a variety of ways that we learn that people are using the app. Ander: Correct me if I’m wrong but it sounds like you’re talking quite a bit about some of the self-employed folks out there, some of the consultants, etc. Ander: But you also have a product for teams and possibly for enterprise in some cases. What do you see are some of the unique challenges with marketing this product into that space and fostering that adoption? Nat: Yeah, there’s a slightly different value proposition for companies. We’ve purposely taken a bottom-up approach so let’s go to consumers, or in this case, self-employed folks first or really end users first because we felt like that would bubble up into the enterprise and that’s kind of what’s happened. Nat: People started using it for themselves. Maybe I’m a salesperson. And then, they started reporting with that to their employers and they could see that these are MileIQ reports and it kind of caught on that way. Ander: Was that bottom-up a strategy by design or did it just kind of end up that way? Nat: It was by design largely because a number of us in the company had worked selling to enterprise before. We knew the different set of requirements. Nat: Plus we were sort of banking on this notion of ‘bring your own apps,’ which is becoming more and more frequent these days, I think partly because the apps that were designed for consumers were designed a little better and a little more enjoyable to use. As I said, the value proposition is a little different. We get calls from procurement folks who has a budget of $20 million for mileage reimbursement and they want to make sure that that’s being reported accurately. Ander: One of the things that is unique about your product is the amount of data that it is generated. Obviously there is so much data every single place that we look for every single tool that we’re using, but you’re taking data that’s occurring in the real world – the miles put on your car – and then digitally translating that into the app and up to the Cloud and wherever else it goes. What have you found has been unique and interesting and cool about having all of this data of how people are using their drives and how people are using the mileage on their car? How has that contributed to how you market the product? Nat: So we’ve logged over 20 billion miles since we started and we’ve learned a lot about driving habits of folks in both business and personal drives, and what kind of cars are most popular in North America. Haha. Nat: And whatever else users have shared with us. I think one of the nice things about MileIQ is that it’s using data that’s already on your phone. You aren’t really asked to enter a lot of data about your drives. It’s all happening automatically. Again, it comes back to the interesting different ways that people are using their app. We have a nurse practitioner who uses the app to prove that she went to a location so that she could get paid. We have a lawyer who was logging the time that he was driving for so that he could get paid for driving to the client. Those are different ways that users are using the data. All the information that we’re giving back to them. But I think generally this is sort of the value outside that we talk about for users is, how are they reporting that? How does that become more seamless for them to get the value out of their drives? So we’ve done integrations with Concur and FreshBooks and we really try to streamline getting the value out for users. Ander: I’m sure people have asked you that before. Nat: Yeah. It’s a really simple answer for us: no, we’re not interested in monetizing this at all, we take our users’ privacy very seriously. Even before we joined Microsoft, it was a big deal for us being very careful about how we treat that data. So, you know, we’ve also talked about how it would be interesting to anonymously surface some of this data for research purposes, for cities perhaps to better understand user driving patterns but we’ve even resisted doing things like that. Ander: I totally understand that. Obviously data is very, very important to the decisions that we make as marketers. However, in some cases, I feel like the emotional or qualitative components of marketing have been forgotten about. It sounds like – especially with some of the stories that you have spoken about with the nurse practitioner, the lawyer, the person using MileIQ as an insurance policy in case they get audited – there’s some real emotional and qualitative value here even for a product in a B2B space. Can you elaborate on that a little bit? Ander: Yeah, I see a lot of marketing that say, ‘Save X amount of dollars per year with this solution, with this tool.’ And every time I see that, I find myself thinking, ‘Ok, that’s great but what does that actually mean?’ Depending on what that money is being saved for, or saved on, it could be financial security. That could be a vacation for a family if it’s a B2C product, or something like that. There are so many different ways that you can look at it and it’s tricky to do in B2B or in more business-focused type tools. Have you guys tested or tried seeing what the difference is between using more quantitative value propositions versus these qualitative ones? Nat: Yeah, we do a lot around money found, time saved, these core benefits that we see. What we haven’t really done is really hard to translate into something in an ad. ‘What is the emotional component of this app?’ That you really can’t get until you experience it for yourself, I think. It’s almost like saying, ‘Hey, you’re going to be better looking and richer if you use this app,’ you know? Nat: That sounds glib to say that but in some ways that would probably work better. You know, it’s hard to say, ‘You’re going to be 20% less stressed by using this app.’ It may be absolutely true. It’s just hard to quantify. Ander: Do you think that there’s any other reason that other products that have these business applications are not doing this? Because I feel like there are so many that could be that aren’t. Nat: I think it’s pretty standard to say, you know, money found, money earned., Uber does this. ‘You’re going to earn this much per month,’ right? I think that’s tangible for a lot of people, like, ‘Wow, $1400 in my pocket.’ That’s meaningful. That could be a better education. I think that’s what you have to get to is what does it actually mean for that consumer? Ander: Right. And, I don’t think there’s any right or wrong answer to this. I’m kind of just exploring this idea a bit. Is it more powerful to be saying you have $1400 extra dollars every month or you have your mortgage for the month covered, you know? Ander: It’s very different. And I think it’s tricky to know which might be more appropriate, depending on the audience. Nat: Yeah, I mean, our number is $6900 the average user is clocking or logging. $6900 in deductions or reimbursements. And that’s the average user. We have users who are logging north of $20,000 to 30,000. They really drive that much. Ander: $20,000 to 30,000 in deductions? Nat: These are people who are driving 6000 miles or more a month. These are the guys that get a new car every year. Nat: Because it’s worn out by the end of the year. Nat: There’s a relatively small percentage but there’s a wide spread of people who are driving to get to that $6900 number. I think a lot of people just don’t believe that number because, again, they’re not used to what they could actually be logging until they start using MileIQ. Ander: Oh, that’s interesting. That’s almost like saying… that deduction is so tremendous it’s almost unbelievable. Ander: And so maybe you would even need something that’s more digestible and concrete. Nat: Yeah, it’s a real number for us so we use it. It’s a claim that we use along with our other claims. And I think that’s pretty standard. What we probably haven’t done enough of is trying to tap into the emotional reaction. But I just don’t think we’ve found a neat way to do that yet. Ander: I don’t think many companies have, to be honest, you know? Ander: Is that something you think more companies might be looking for ways to do in the future? Nat: Absolutely. I mean, I think maybe a standard way to do it is showing one of your customer’s views. but people sort of second guess that ‘Is that really real? That could have been written by anyone’ You know? Nat: But like I said, it’s the thing that keeps us coming to work every day. We’re constantly floored by the kinds of reactions that people have to a simple service like MileIQ. Ander: And, I know a lot of your thinking around the marketing and MileIQ product in general has been consistent since before your acquisition eighteen months ago. But given that you were acquired by Microsoft, such a significant company, how has coming underneath the umbrella of such a significant company changed how you think about your marketing? Nat: I know a big part of the reason we joined Microsoft is that our missions lined up pretty nicely. MileIQ and the apps that we’re now building are all about automating productivity, helping you be more productive. And this new Microsoft that we’ve joined is all about helping every organization and every individual in the world to achieve more. So it seemed like a really nice way for us to scale up what we were doing and reach more people in the process. So it really is about reach and scale. And, you know, being part of the Microsoft engine, obviously has some benefits. Nat: Their businesses are just so large, haha, compared to even our great business for an app, you know? We have really great business for an app. But when you compare it to some of the established businesses of Microsoft, it’s small, obviously. Nat: I think we’re still navigating the best way to do that. Obviously we’re integrating our technology and our tech stack, but more importantly we’re figuring out the appropriate ways to get in front of Microsoft users and Microsoft customers. There’s going to be some announcements coming up in the very near future, actually, that speaks to one of the things that we’ve been working on for a while. I can’t talk about it just yet. Ander: Very cool. Totally understand. Nat: But within a month, early June, you’ll hear something about kind of like the first step that we’re making in that respect of more properly integrating with parts of Microsoft. Ander: Well, I’m looking forward to seeing that announcement. I have one last question for you as I know that we’re running out of time. In the context of some of the things that we’ve talked about, what’s something that you think marketers can be doing to make marketing better? That could be the community of marketers as a whole, whatever it might be. Nat: One of the things that we do on a fairly regular basis that I have really come to like is just sitting down with other marketing teams and comparing notes. In this case because we’re mobile-focused, it tends to be other mobile growth teams. And I like that for a couple of reasons: one is you tend to learn things that you didn’t know or things that maybe you’re doing that other people have taken a different spin on. It’s a great learning opportunity. I think, I wouldn’t call it networking per se, but I would call it being generous. Nat: Yeah, knowledge sharing and being generous. Not holding back. You know, certainly we’re not going to full-on competitors and having those kinds of conversations but we meet with companies in quite different industries who have the same growth problems or challenges that we have and that’s really interesting. We get to learn about different industries but in sort of a common platform, I guess. Ander: That makes perfect sense and I completely agree with you. That’s one of the reasons we do this podcast at Instapage is to encourage this knowledge sharing. There’s so many great marketers out there with great ideas and great resources and different perspectives here in the Bay area – and beyond, of course – so it’s something we encourage as well. Nat, this has been a pleasure. Great conversation. Really appreciate you taking the time to have me here in your office. Are we in the Twitter building? Nat: We’re in Market Square building. I think it’s commonly called the Twitter building. Ander: Ok, but officially it’s the Market Square building. With that awesome grocery store downstairs. Nat: We like to think of it as the Microsoft building. Haha. Ander: Of course, yeah! What am I talking about? This is the Microsoft building. But once again, thank you so much for having me here. Really appreciate your insights and I am sure we’ll talk to you soon. Nat: Ander, thanks for having me. It’s been great.